In rural Irish communities of the early 1800s weather forecasting was anything but precise. There are many tales of people who were locally revered for accurately predicting turns in the weather. Yet without the science we now take for granted, weather events were often viewed through the prism of superstition. One particular storm in 1839 was so peculiar that rural folk in the west of Ireland, stunned by its ferocity, feared it could be the end of the world. Some blamed it on the “fairies,” and elaborate folk tales sprang from the event. Those who lived through the “Big Wind” never forgot it. And for that reason the horrendous storm became, seven decades later, a famous question formulated by the British bureaucrats who ruled Ireland. Snow fell across Ireland on Saturday, January 5, 1839. Sunday morning dawned with cloud cover that amounted to a typical Irish sky in winter. The day was warmer than usual, and the snow from the night before began to melt. By midday it began to rain heavily, and the precipitation coming in off the north Atlantic slowly spread eastward. By early evening heavy winds began to howl. And then on Sunday night an unforgettable fury was unleashed. Hurricane force winds began to batter the west and north of Ireland as a freak storm roared out of the Atlantic. For most of the night, until just before dawn, the winds mauled the countryside, uprooting large trees, tearing thatched roofs off houses, and toppling barns and church spires. There were even reports that grass was torn off hillsides. As the worst part of the storm occurred in the hours after midnight, families huddled in total darkness, terrified by the relentless howling winds and sounds of destruction. Some homes caught fire when the bizarre winds blasted down chimneys, throwing hot embers from hearths throughout cottages. Newspaper reports claimed that more than 300 people were killed in the wind storm, but accurate figures are difficult to pin down. There were reports of houses collapsing on people as well as houses burning to the ground. There’s no doubt there was considerable loss of life as well as many injuries. Many thousands were made homeless, and the economic devastation inflicted on a population that was nearly always facing famine must have been massive. Stores of food meant to last through the winter had been destroyed and scattered. Livestock and sheep were killed in vast numbers. Wild animals and birds were likewise killed, and crows and jackdaws were nearly made extinct in some parts of the country. And it must be kept in mind that the storm struck in a time before government disaster response programs existed. The people affected essentially had to fend for themselves. 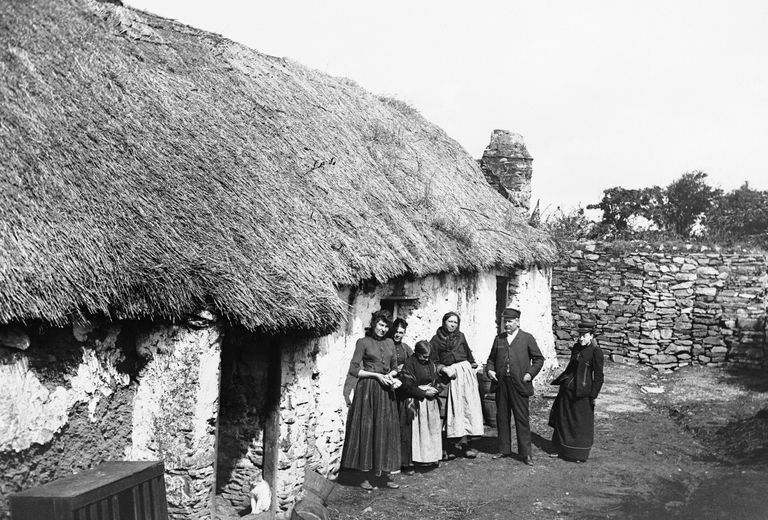 The tural Irish believed in the “wee people,” what we think of today as leprechauns or fairies. And tradition held that the feast day of a particular saint, Saint Ceara, which was held on January 5, was when these supernatural beings would hold a great meeting. As the mighty wind storm had struck Ireland on the day after the feast of Saint Ceara, a storytelling tradition developed that the wee people held their grand meeting on the night of January 5, and decided to leave Ireland. As they left the following night, they created the "Big Wind." The night of January 6, 1839 was so profoundly memorable that it was always known in Ireland as the "Big Wind," or "The Night of the Big Wind." "'The Night of the Big Wind' forms an era," explained a reference book published in the early 20th century. "Things date from it: such and such a thing happened 'before the Big Wind, when I was a boy.'" A quirk in Irish tradition was that birthdays were never celebrated in the 19th century, and no special heed was given to precisely how old someone was. Records of births were often not kept very carefully by civil authorities. This creates problems for genealogists today (who generally have to rely on church parish baptismal records). And it created problems for bureaucrats in the early 20th century. In 1909 the British government, which was still ruling Ireland, instituted a system of old age pensions. When dealing with the rural population of Ireland, where the written records might be scant, the ferocious storm that blew in from the north Atlantic 70 years earlier proved to be useful. One of the questions asked of elderly people was if they could remember the "Big Wind." If they could, they qualified for a pension.